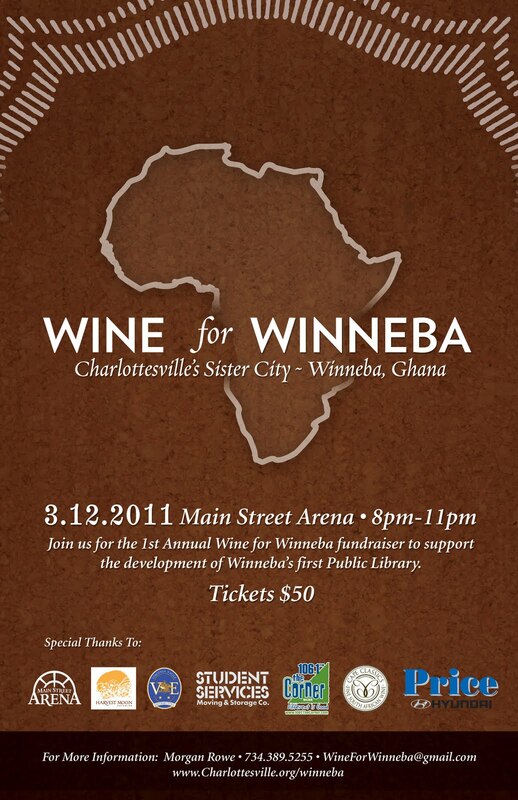 Tickets are now available for the "Wine for Winneba" event at the Main Street Arena on Saturday, March 12, from 8-11pm. This is the main fundraising event in support of the Charlottesville delegation's upcoming visit in May to help our Sister City of Winneba, Ghana, lay the groundwork for their first public library. No taxpayer funds will be used for this trip so we are relying 100% on community support. "Wine for Winneba" will feature delicious food (courtesy Harvest Moon Caterering and Carpe Donuts), great company, lively music, excellent raffle prizes, and an open bar featuring South African wine and Starr Hill beer. Tickets are $50 each and 100% of the proceeds will be donated to the Winneba Public Library Project. Many thanks to our wonderful sponsors for making this night possible: Main Street Arena, Harvest Moon Catering, Price Hyundai, Student Services Moving & Storage Co., Virginia Eagle, Cape Classics, 106.1 The Corner, Angelo's Jewelers, Keswick Hall, and the Downtown Grill. To purchase your ticket(s) using a credit card, debit card or automatic check withdrawal, please click below. Your tickets will be held for you at the door. You can also just pay at the door on Saturday night. UPDATE: Now through Saturday, Seasonal Cook at the Main Street Market has tickets available for a discounted rate of $40!